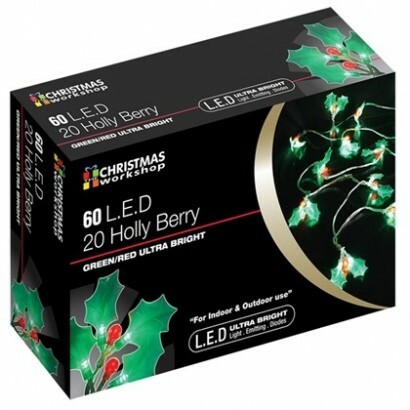 Decorate your home or garden for Christmas with beautifully festive holly and berry lights lit with red and green LEDs. Spread Christmas cheer with LED fairy lights decorating twenty clusters of holly leaves each lit with two green LEDs and one red berry adding extra sparkle to your home. 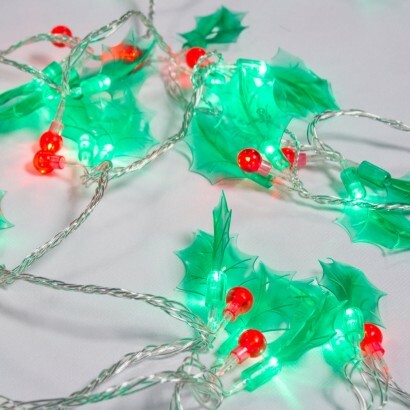 Suitable for use indoors to outdoors (with a protected socket), the green holly leaves are made from soft flexible plastic for durability and capture the light from the LED in the stems perfectly. With 2.85m of illumination, these fantastic festive lights add instant Christmas cheer to your home both inside and out!